I’ve been in such a DIY mood recently! It doesn’t matter whether it’s nail art or arm candy, I’ve been bit by the DIY bug. Today I decided to spice up some old silver bangles with some craft lace. I actually saw someone else do this on Etsy a little while ago, so I don’t want to take any credit for the idea. But I believe good ideas are made for sharing, so I’ve decided to create a little tutorial on how to make this lovely craft lace bangle. It’s super easy to do, all you need is a couple old bangles and craft lace, or you can even use leather cord – whatever you have handy! 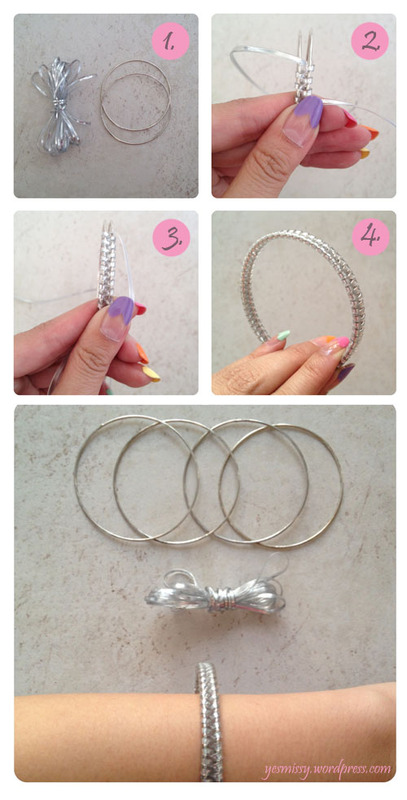 Pull out your supplies, 2 bangles and about a foot of craft lace. Hold the 2 bangles side by side in one hand. 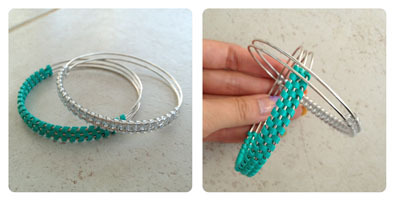 Use your thumb to hold the one end of the craft lace securely while you weave the other end over and under the bangles. Continue weaving the craft lace all the way around until you have wrapped the entire length of the bangles. Simply tuck the ends of the craft lace inside the loop of the previous weave, and clip off ends. To make sure it’s extra secure, you can use glue gun to seal the ends along the inside of the bangle, but it’s not necessary. Voila! You’ve turn your old boring bangles into a new piece of arm candy! 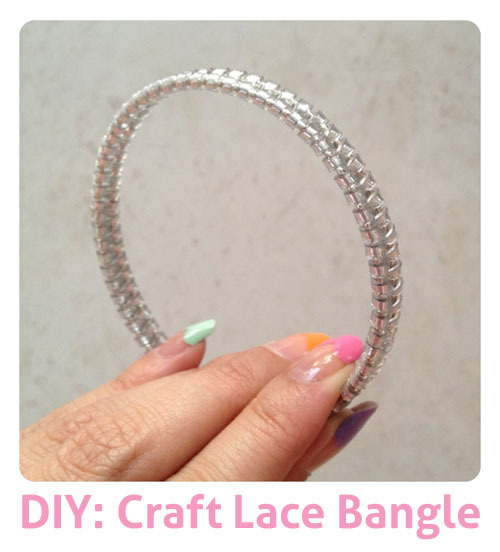 I suggest you also try this weaving technique with more bangles to create a wider bangle or even with various colors of lace. I hope you enjoyed this tutorial! UPDATE: So I actually tried this out with 3 bangles and I also decided to give it a new twist. This time I only weaved the lace through only half the sides of the bangles, leaving the other half exposed. This is how it looks! "Nail DIY: Easy Nail Art – Hearts & Stripes"
"DIY: Ribbon Pearl Bracelet Tutorial"